Some may have noticed a borrage of scandalous photos hitting the SL interwebs this past holiday season. It seems it was all part of the strategic marketing campaign for the newly opening RP sim Alura Hills, home of the exclusive Lure Manor. Spearheaded by the AVENUE Marketing team this project definitely got a reaction within the SL community. Good or bad…there was a reaction, even within the role-play never before have the inner stories of SL’s fashion elite been so exposed. In an economic climate where less are logging in and less are spending, it may be just the right time to settle into some fun and awaken our inner fantasies. Alura Hills is a full role-play community divided over 2-sims, first entering into the town with shops, theatre, cafe and club, one can enjoy themselves even outside of the “story” being built around them. Or if you’re interested in exploring the role-play deeper you can work to gain access within the most elusive layers of Lure Manor. There truly is something for everyone. AVENUE would like to thank all who were involved in helping create this story. What first started as a small idea was slowly weaved real time into a elaborate plot with the aid of every writer, actor, photographer and you our audience. For the full story please see gossip columnist Misha Selene’s blog allalure.blogspot.com and come visit Alura Hills for yourself. The sim will be open to the public on Sunday, January 8th…with only private access given to exclusive key holders before. Interested to become a key holder? 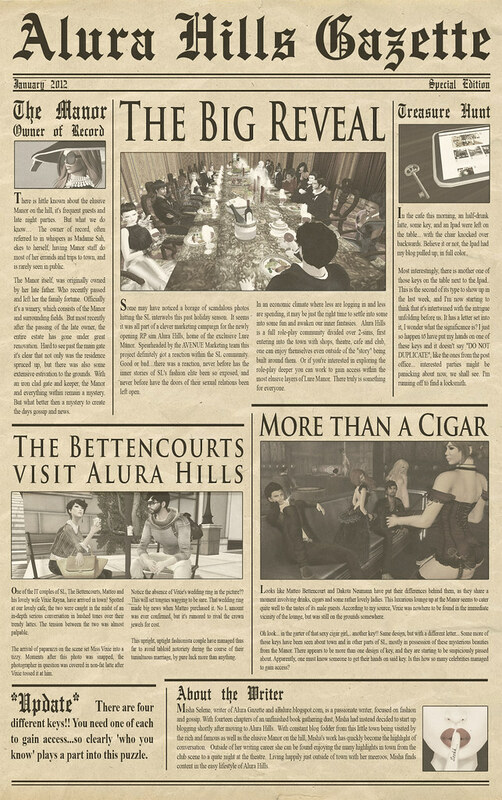 Your first clue can be found within this newspaper, check your folder.